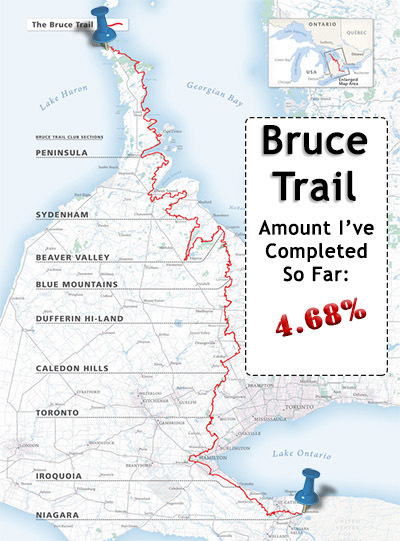 When I announced my intention to end-to-end hike The Bruce Trail in stages, I have to admit that a few of the positive responses that I have received on this site and on social media have helped to spur me on a little. I had some spare time on “Blue Monday”, supposedly the saddest day of the year, and so I decided to try to “find my happy” by heading back down to The Niagara region. This happened to be on the same day that The Government of Canada issued an “Extreme Cold Weather Warning”. It could reach -35°C with the windchill, they said. If you read about my hike through Bruce Trail Map 01, you’ll know that I slugged my way from Queenston Heights to just beyond “Fireman’s Park”, noting how unfit I had become in the last few months. Having done nothing to improve the situation, I repeated the car journey along “North America’s busiest stretch of highway”, The 401, then briefly onto The 427, then The Queen Elizabeth Highway (QEW) which was named to coincide with a visit from George VI and Queen Elizabeth The Queen Mother in 1937. You get a good view of the western edge of Lake Ontario as you pass over The Burlington Skyway, continuing to just before St. Catharines and the replica ship of La Grande Hermine that sits forlornly in Jordan’s Harbour. Such a strange effect was taking place during this frigid morning as low cloud hung over the lake and hundreds of arms of mist reached towards the sky like Poseidon grasping for the heavens. 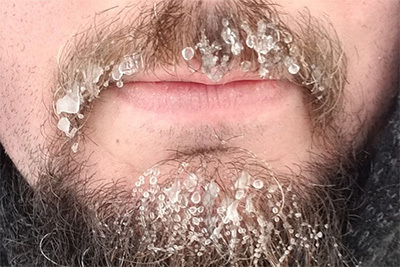 Although I don’t think it ever really dipped as low as -35°C, it was cold enough that my breath would blow back at me, condensate in my facial hair, before freezing into pieces of ice. Despite this, my coat ensured that the rest of me never felt too cold. Things didn’t start so well. Upon arrival, it appeared that the parking lot had not been ploughed, but I decided to drive forwards to get a closer look. My car got stuck in a snow-filled dip at the entrance and took a few minutes to free again. I parked on the side of the road and hoped not to annoy anyone. Next up, I managed to go the wrong way! This was hugely frustrating, but my own fault. I got the idea into my head that I had to take “Fireman’s Park Side Trail” to reach The Bruce Trail, but for some reason I never actually checked the map to confirm if this was correct. Remember, folks: Always check the map. In actuality, the side trail and the main trail both start from where I had parked and head in different directions. I walked about 1km along the side trail before I realised that something wasn’t right. The deep snow was a killer on steep terrain. After slipping and sliding my way up a ridge, I was gasping for breath. As I came to realise my mistake, I was concerned that this waste of time had also almost completely sapped me of energy. When I got back to the car, I still had trouble orientating myself. To save you from reading any more about this ridiculous situation, it’s mostly my fault for not being prepared but also partly because there are Bruce Trail blazes that aren’t represented on the map. They enter some woods, travel a few hundred yards, before exiting back onto the road. Maybe this is an old re-route. Maybe I am just easily confused. About 30 minutes later, the time reaching 11 am, I finally realised that the trail was actually a few hundred feet south on Dorchester Road, across a railway crossing that I had mentioned in my last post. Swinging immediately to the right into some woodland, the trail runs parallel to Canadian National Railway tracks. I got a real thrill when one of CN Rail’s powerful, long trains blustered through, billowing clouds of snow all around. Progress along the trail began easily enough (considering the weather conditions) because someone had already been through with an all-terrain vehicle. I was able to tread in the tyre tracks that were left behind. After weaving up and down a couple of hills, the trail returned to the same old railway bed that it had also followed back near Queenston. This stretch of trail was even easier because the snow had been cleared almost entirely by a plough. I walked past some kind of electrical unit which I recognised – this was the point where I ended my first hike. Continuing through a crop of young trees, suddenly the snow was back to being as deep as my shins and it was completely untouched – except for the nearby deer that I could hear rustling just out of sight. The hiking became difficult at this point. I had to kick and drag my feet through the snow and was already quite drained by the exertion of my earlier hike spent travelling in the wrong direction. 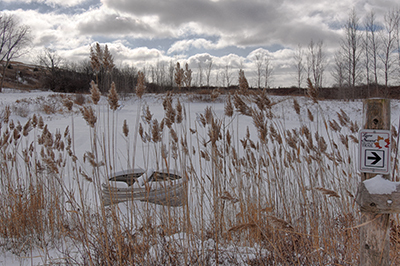 Somehow life hangs on through the harsh Canadian winter, but looking around the snow-covered scene it felt like the only things that could possibly be living were the Cattails poking out of the surrounding lagoons and red staghorns of Sumac. As well, the birds flitting amongst them. Throughout today’s hike, I saw many Dark-eyed Juncos, Blue Jays, several pairs of Cardinals and a very vocal Downy woodpecker that I heard before I saw it. His calling “pik” sound is somewhat similar to that of the Northern Cardinal, but less metallic sounding, of a lower pitch and the note is held for longer. Large parts of this section of trail are also shared with The Laura Secord Friendship trail (as well as the Trans-Canada trail, recently renamed “The Great Trail”, which traverses the length of Canada). Despite being the daughter of a patriot, Laura Secord married a loyalist named James who served under General Brock at The Battle of Queenston Heights. Although his militia enjoyed victory in Queenston, James was seriously wounded. Through 1813, he would be nursed back to health by Laura. By the summer, The Americans had successfully invaded the Niagara region and soldiers were billeted in the Secord home. Legend has it that, as the soldiers ate their dinner, Laura Secord overheard talks of an American attack on the British position at Beaver Dams. The next day, she hiked 27km from just north of Queenston Heights (where I began my journey), to just south of St. Catharines. There, she met with a camp of Mohawk warriors who were allied to The British. They escorted her another 5km to Lieutenant James FitzGibbon so that she could impart her information. The Laura Secord Trail approximately follows her journey – a journey that is more than double the distance I have achieved so far. During The Battle of Beaver Dams, native warriors closed in on the flanks of the 500 Americans and launched a surprise attack. British regulars joined later and agreed to call off the Mohawk warriors only if The Americans surrendered. Thanks to the information shared by Laura Secord, The Americans were out-manoeuvred and they duly surrendered. Laura Secord lived the rest of her life destitute, particularly after the death of her husband. She was not recognised during her lifetime, aside from a belated award of £100 from Edward VII (at the time he was The Prince of Wales) during a visit to what would have been “The Province of Canada” in 1860. The prince was told of Laura’s story, her contribution, and her current unfortunate financial state. These days, Laura Secord is a woman of great legend and a Canadian heroine. On Day One of my Bruce hike, I had hoped to reach Welland. Pretty quickly I realised how unrealistic that was. But today it would surely be possible? Again, no. 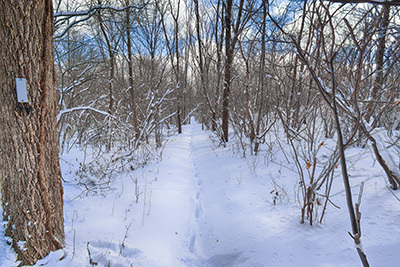 As I had to wade through more and more snow – a never-ending supply of snow – it became apparent that for the second time that I just wasn’t going to make it that far. I examined the map for the next parking area to make it easier to pick up the trail in the future. There were three parking options all grouped together about 3km away, but I was exhausted. Even 3km seemed difficult. I was about 1km-2km away from a supposedly haunted tunnel (aptly named “The Screaming Tunnel”). Surely anything less than making it that far would be embarrasing? It wasn’t just the depth of the snow. There were slippery steps that you couldn’t see under the snow. 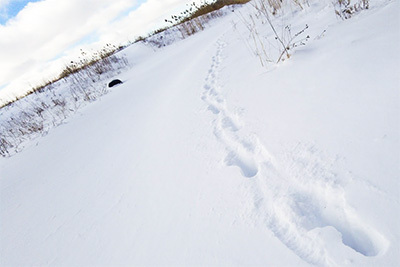 There were bits of trail that had been boggy, were now frozen over with thin ice, hidden by a layer of snow. I would take a step, the ice would collapse, and I would fall knee deep and winded into a hole. It was a hell of an effort to climb back to my feet after this happened for the third time. At one point, I passed a drain of some kind. It had a grate over it, but the gaps in the grate were wide enough that your leg could easily fall through. Luckily it was exposed enough that I saw it. A large pedestrian bridge crosses a stretch of The QEW highway that I would have driven under an hour or two ago. This bridge marks 10km from the beginning of The Bruce Trail and about 3km of progress made today. The bridge was free of snow, perhaps from the rising heat of passing vehicles or from the lateral direction of blowing wind. My legs felt like they were floating, such was the relief from the lack of snow. A short distance later the trail turns to the right, through The Screaming Tunnel. A number of different interpretations of a ghost story surround the local name for this tunnel, which allows you to cross beneath The CN railway tracks. Some say that a young girl was set alight and ran for these tunnels screaming before her death. Another story tells of an unhinged woman who was hated by neighbours. After frequent quarrels and fights, she would travel to the tunnel at night to scream in her madness. If you stand in the tunnel at night and strike a match, the screams of the ghost will fill the air and a whoosh of wind will extinguish the flame. The Bruce Guide warns that the tunnel is often filled with ice during winter, and so it was to be. 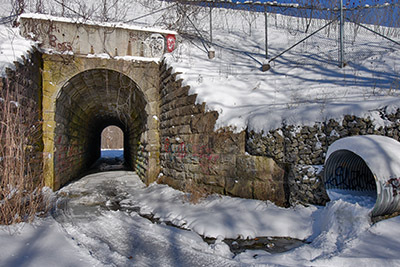 A culvert ejects water in to the tunnel and in these cold conditions it was completely frozen. The ice was fairly uneven and there was snow in places, which afforded me enough grip to make it through unscathed. At the other end of the tunnel, I turned left onto Warner Road. The difficulties I’d had earlier combined with my need to have lunch meant that I was running out of time. I was close, but wouldn’t be able to make the parking. This wasn’t quite the end of the world. On the next hike, I would have to walk backwards along the trail to where I left off and then turn around and go forwards again. I already have to double-back anyway. I continued along Warner Road, up and down a couple of crests, passing farmland and a vineyard. The ploughed road was another relief to my legs. I was quite sore by now, with my left leg, in particular, starting to tighten. Due to the time, I decided that I would eat lunch as soon as I saw a viable place to sit, and then I would turn back. After around 1.5km, the trail turns right off Warner Road onto the edge of some property. After this, it will enter Woodend Conservation Area. That will have to wait until next time. For today, I found a fence to sit on and I ate some lunch. In total, this is 11.8km along the trail. In two days, I have hiked about 1/3 the distance of Laura Secord! 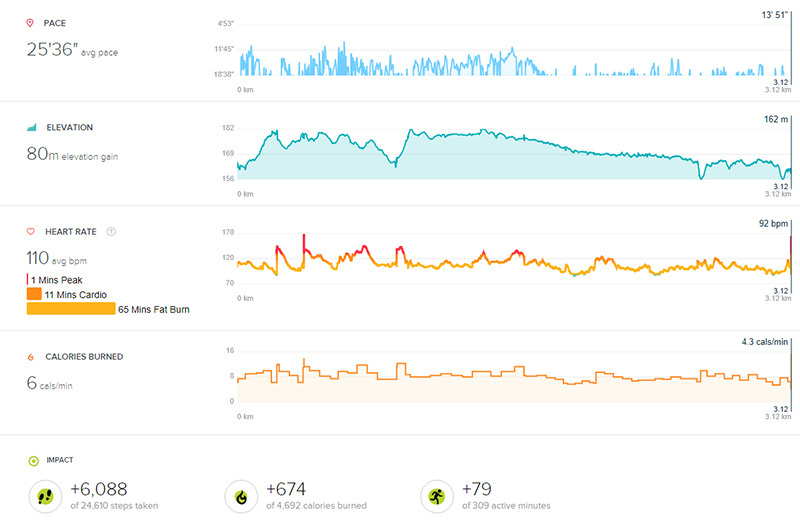 On just today’s hike, I had travelled about 5km, not including getting lost. Sitting still for a while felt good, but it did allow the cold to take hold for the first time, so I didn’t stay long. Walking back was very slow going and I was pretty much dragging my left leg by the time I got back to the car. I didn’t pass a single person on this section of trail, although there were several more cars parked on the side of the road once I had returned. Most people were in Firemen’s Park sledging or snowboarding down the slopes. It will be a disaster if I don’t get to Welland next time! The weather should be better, so I would like to make it as far as Thorold – which would mean I would make it to Map 03. I haven’t touched on my personal circumstances yet, but they have played a part in making this end-to-end hike happen, and I’m sure I’ll spill some beans at some point. Right now, there are some things afoot which means I’m not sure exactly when I will be revisiting The Bruce Trail – but I’m excited that it won’t be too long. Brilliant read stu, would love to join you on one of your hikes. You were trying to purchase my art, right?